I‘ve always known Elviyya Sadigova as an intelligent, sharp witted and dedicated student of humanities with deep interest in history and modern languages. Most of our chats revolve around the Middle Eastern affairs, discussing recent developments and their implications on future. A twenty-year-old based in Baku, Azerbaijan, she speaks five other languages, besides her native Azeri language, including Russian, English and Arabic; not to mention her in-depth analysis of the Middle Eastern developments that are regularly featured on Azeri news websites. City of Winds, as its known, was bracing to weather a chilling storm. Hardly five kilometres from Elviyya’s Baku State University, the students of the State Oil Academy packed to their classrooms just after 0900 in the morning as the classes began. The educational institution, known as Azerbaijan State Oil Academy (ASOA) was founded in 1920, has produced renown graduates like Lavrentiy Beria, the former KGB head under Stalin’s rule; José Eduardo dos Santos, the current President of Angola and Heydar Aliyev, the all powerful president of post-Soviet Azerbaijan. Within half an hour, at around 0930, everything came to a halt when a shooting frenzy rocked the building and plunged everyone present there into confusion and chaos. What ensued during and after the shooting jolted the whole nation and remains to be investigated thoroughly. According to some students present at the scene, two gunmen stormed the building after shooting dead the security guard. They made their way to the top (6th) floor while randomly spraying bullets at anyone within their range. “We were attending the lecture and someone began to kick the door. Suddenly two [guys] burst into the room and shot at the students sitting in the front row. The students began to flee the lecture hall. When I left the room I saw a lot of wounded people in the corridor. The gunmen were of Slavonic origin. One of them was in mask. As they did not speak, we could not know their nationality,” the Azeri news agency APA quoted a student without naming him. 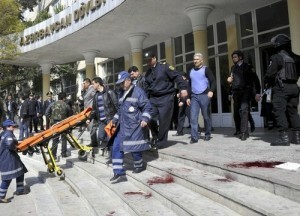 According to the official sources, the attack happened in the Building 2 of the State Oil Academy of Azerbaijan located in the Dilara Street, in central Baku. The perpetrator was a 29-year-old Georgian citizen of Azeri descent. 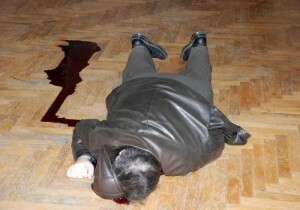 He was identified as Farda Asad Gadirov. The official statement added that the lone gunman turned the gun on himself as soon as the special police force stormed the building. “He climbed from the first floor to the sixth, shooting people mainly in the head from a Makarov pistol,” the state prosecutor’s office said, adding that three ammunition belts and 71 bullets were found on the body of the attacker. 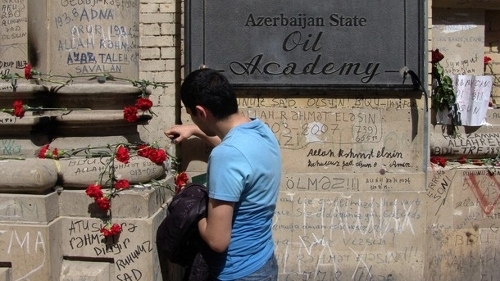 “The armed attack on the State Oil Academy in Baku killed 12 and wounded 13 on April 30,” the spokesman of the Prosecutor General of Azerbaijan, Eldar Sultanov, declared in a press conference next day after the incident. He strongly denied reports in some sections of press that it was a politically motivated attack. “Such incidents happen in many countries,” he added. 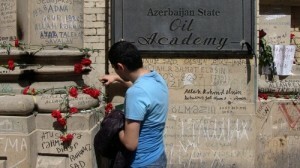 Students in the nearby Baku State University were informed about the happenings in Oil Academy. The security was tightened immediately and the pupils were asked to stay in the lecture halls until further notice. These steps helped students stay calm and avoided confusion at the campus. I immediately asked about the safety of her friend, to which Elviyya replied: “She is alive but her boyfriend is dead. Just in front of her eyes he was shot in the neck. You know the murderer aimed perfectly at head or neck, killing and injuring many people.” She added that Parvin (her friend) thought there might be more than one perpetrator but is not really sure about it.